After the merging of PLDT, Smart’s parent firm, and Digitel, Sun’s mother company, the public is quite skeptical that the collaboration of the two telcos will monopolise the industry. But despite of the oppositions, the deal has been signed. 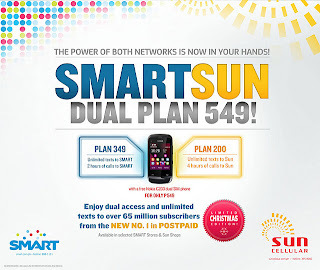 After almost two months, Smart and Sun’s first joint offering comes out today, December 13, 2011, via the SMART-SUN DUAL PLAN 549. 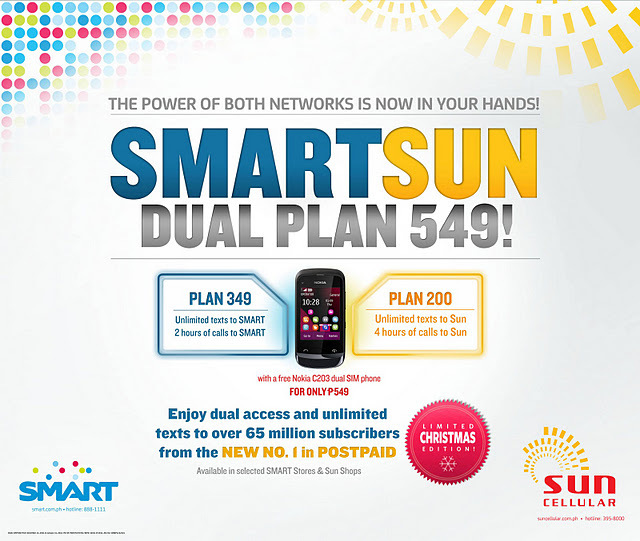 The SMART-SUN DUAL PLAN 549 is a dual line postpaid subscription and is the first of its kind in the market. Basically, it’s a combination of Smart Plan 349 and Sun Plan 200. With this latest offering, Smart offers unlimited Smart to Smart SMS plus 2 hours of Smart to Smart calls. Sun, on the other hand, has unlimited Sun to Sun SMS, 4 hours of Sun to Sun calls with 500 SMS to other networks. The SMART-SUN DUAL PLAN 549 comes with a free Nokia C203 dual SIM phone and is locked in for 24-month period. As per advertisement, this is a limited Christmas edition offering of the two networks and is available only in selected SMART Stores and Sun Shops. I believe yes, you’ll maintain 2 numbers – one for Smart, and the other for Sun since this is a Dual Plan with a dual phone. The advantage, on the other hand, is that you’ll just apply for a one postpaid line rather than getting two separate subscriptions. So you still maintain 2 numbers?